Sixty-five midwifery and nursing students graduate from Juba College of Nursing and Midwifery and Kajo Keji Health Sciences Institute. Juba, South Sudan – Minister of Cabinet Affairs Dr. Martin Elia Lomuro told new graduates of midwifery and nursing students from Juba and Kajo Keji to take pride in their profession as they will be serving in the health sector, which is addressing a serious gap in health workforce. 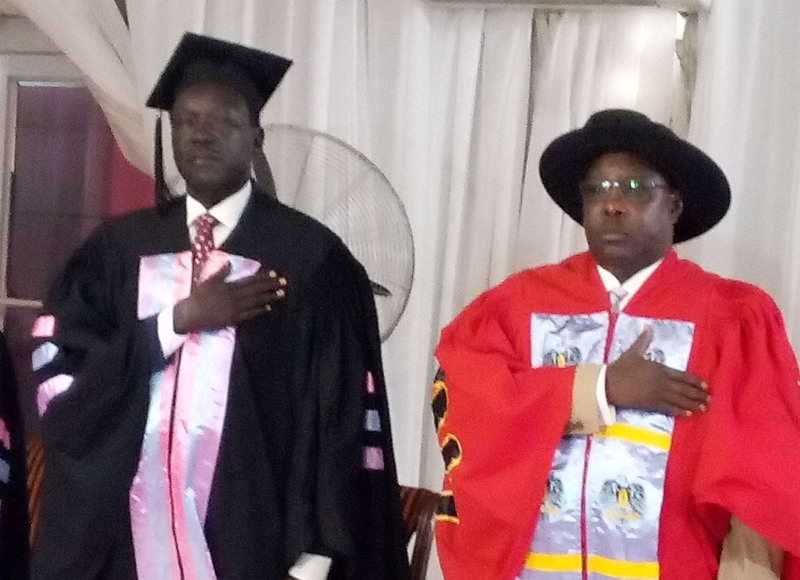 The minister referred to the graduation rite as a continuing form of liberation for the people of South Sudan. “We are continuing to liberate ourselves and our people… to have the freedom to graduate the students to serve in the health sector. I congratulate you and ask you to be very proud of the profession you have chosen to serve your people and country,” he said. The 51 midwifery and 14 nursing students from the Juba College of Nursing and Midwifery (JCONAM) and Kajo Keji Health Sciences Institute graduated through the scholarship programme under the Strengthening Midwifery Services Project of the UNFPA and Ministry of Health (MOH). The project, funded by the Governments of Canada and Sweden, aims to increase the number of midwives and nurses in South Sudan, which has one of the highest maternal death rates in the world with a maternal mortality ratio (MMR) of 789 deaths per 100,000 live births. One of the contributing factors to the high MMR is the severe shortage of trained skilled birth attendants and other health workers. Minister of Cabinet Affairs Dr. Martin Elia Lomuro (right) with Health Undersecretary Dr. Makur Kariom during the graduation rites. Dr. Lomuro acknowledged the problem but took note that through the midwifery project, the number of midwives and nurses in South Sudan grew from nine to 865 in a span of eight years – a big feat for which the MOH should be congratulated. Developing human resource for the health sector in South Sudan sits on top of the priorities of the government to improve the quality of lives of the citizens and to globally contribute to achieve the sustainable Development goals, the Minister said. The students from Kajo Keji HSI, which lies at the border with Uganda on the south, were relocated to JCONAM following the fighting in 2017, which displaced thousands of residents, including the students and tutors from the HSI.